an introduction to celebrated naturalist John Burroughs with Bill Birns at Morgan Outdoors. Burroughs, born in 1837 on the family’s Delaware County homestead in Roxbury, NY, authored 27 books of natural and philosophical essays that influenced millions of readers. Of particular interest in this presentation are Burroughs explorations and walks in the upper Delaware River watershed, from Woodchuck Lodge in Roxbury to Balsam Lake Mountain, and points in between. John Burroughs was in our neighborhood! Author and educator, Bill Birns, is a 47-year resident of the Catskills and taught English at Margaretville Central School and Onteora High School. He authored “A Catskill Catalog”, published by Purple Mountain Press, and “The Myth in the Mountain”, a poetry cycle set in the Catskills. His latest book, “I Was Corning A Beaver Like You Do: Joe Hewitt, John Burroughs, Mountain Culture” will be available for purchase at Morgan Outdoors, as will “John Burroughs Afloat & Afoot”, the first and, so far, only Burroughs audiobook ever published. All proceeds from book sales at Morgan Outdoors will benefit new outdoor amenities at Woodchuck Lodge. Concurrently on display at Morgan Outdoors is the exhibition “Streams: Art in Motion“, which highlights the wonders of the upper Delaware River watershed, in which Burroughs was born, spent many years, and produced beautiful writings. To reserve a seat, call 845 439 5507, as seating is limited. Morgan Outdoors is located at 46 Main Street, Livingston Manor, NY. For more information: www.morgan-outdoors.com. 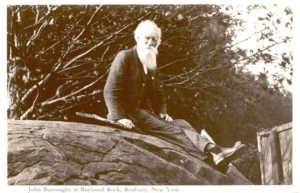 PHOTO CAPTION: Reminiscing his boyhood, John Burroughs (1837-1921) sits atop his Boyhood Rock, about 1910. The glacial boulder sits in what is now a New York State Memorial to Burroughs, on the hardscrabble Catskill Mountain farm in Roxbury NY where he grew up.